Save the Budapest Festival Orchestra! The Budapest Festival Orchestra - which was in London yesterday to give a stunning performance of The Magic Flute (more of that shortly) - is being threatened with gigantic cuts to its funding from Budapest's Municipal Assembly, amounting to 200m forints - about €940,000 - reducing to 60m forints. That's reducing the funding by around three quarters. On Saturday afternoon the orchestra and its conductor, Iván Fischer, held a musical demonstration in downtown Budapest. To a packed Vörösmarty Square, Fischer declared (according to Hungary Today): "First and foremost we are here to demonstrate that we really love Budapest and we know, too, that Budapest really loves the Budapest Festival Orchestra... We want a Budapest that has more music, more happiness, more love and less hate." He reportedly spoke out for minority groups, saying that the orchestra wants them to feel as welcome in Budapest as anyone else, in an environment filled with music. In the video above, Hanno Müller-Brachmann sings Sarastro's aria from The Magic Flute, in which the sage tells his assembly that there is no place for revenge and hatred in his realm. 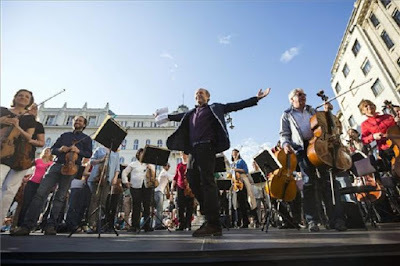 Hungary Today further reports that Budapest's mayor, István Tarlos, has said that the city council will continue to support the orchestra to the extent that its budget permits. Richard Morrison in The Times, though, has quoted a "more sinister reason than austerity" behind the cuts. Fischer's openly humanitarian stances have not always been welcomed under Viktor Orbán's government. The orchestra has had to cancel some of its schools and community projects as well as some concerts in Budapest. The Budapest Festival Orchestra remains the only orchestra for which I drop everything and run, not only superb but also vivid, flexible, positive and endlessly creative. I'm about to write up a review of last night's Magic Flute, which was a musical dream come true. To slash support for a national treasure of this calibre would be to do something considerably worse to one's own face from spite than cutting off the nose.